It’s the night before the big launch and you still have not finished coding the website. One browser gives you trouble and there’s no time to refactor everything to prevent the problem from appearing in the first place. If only you could target the troublesome browser and feed him a specific rule that will account for the difference in rendering. This is the moment when Browser Hacks comes to the rescue. 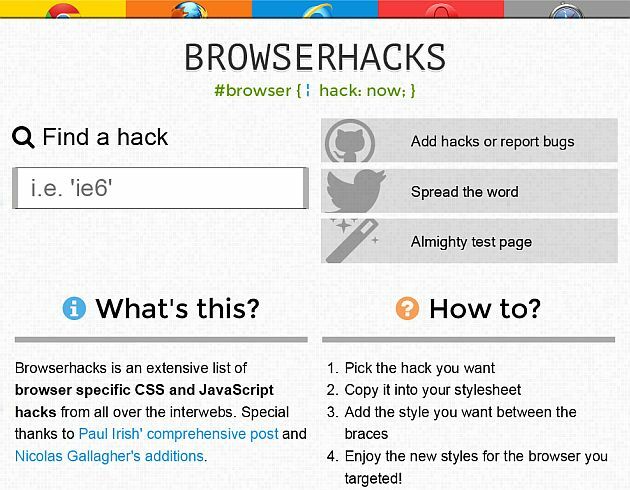 This website is a collection of proved and tested hacks that will save you an all-nighter and allow you to keep the deadline in launching your project. One note of caution though: As their own name sounds, hacks are quick and dirty solutions for desperate cases. There’s always the possibility that they might turn back on you and bite you in the a**, so use caution when deploying them. Sometimes, a different approach might be more efficient.